Razing Storm is an arcade light gun shooter which runs on the Playstation 3 based System 357 arcade hardware. Players must take on terrorists as part of the special forces unit SCAR in South America circa 2030. Razing Storm has a machine gun controller that shakes and generates sound through a speaker in the gun. The SD cabinet has a 42 inch monitor and uses 5.1ch DTS Digital sound. The machine also features an action pedal which allows you to take cover and avoid gunfire. 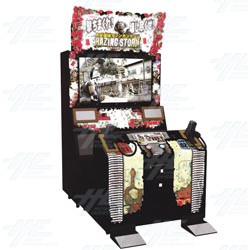 Razing Storm is an arcade light gun shooter which runs on the Playstation 3 based System 357 arcade hardware.